MARCH 5, Referred to Committee on Commerce and Labor. SUMMARY Revises provisions governing workers compensation. Download "MARCH 5, 2015. Referred to Committee on Commerce and Labor. 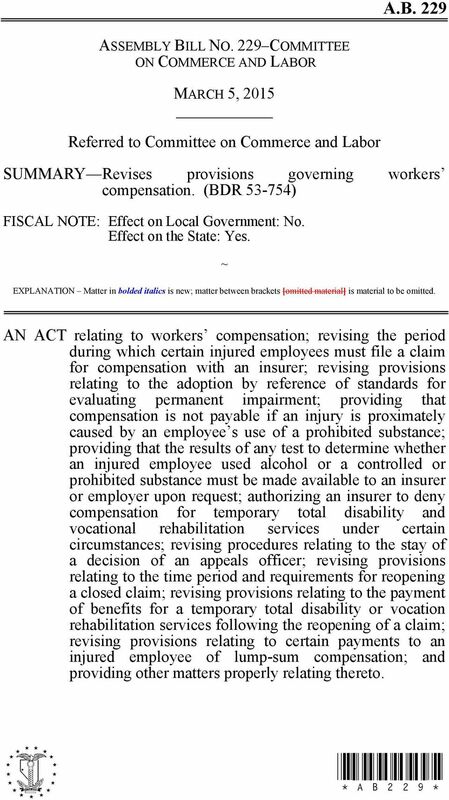 SUMMARY Revises provisions governing workers compensation." 1 A.B. ASSEMBLY BILL NO. 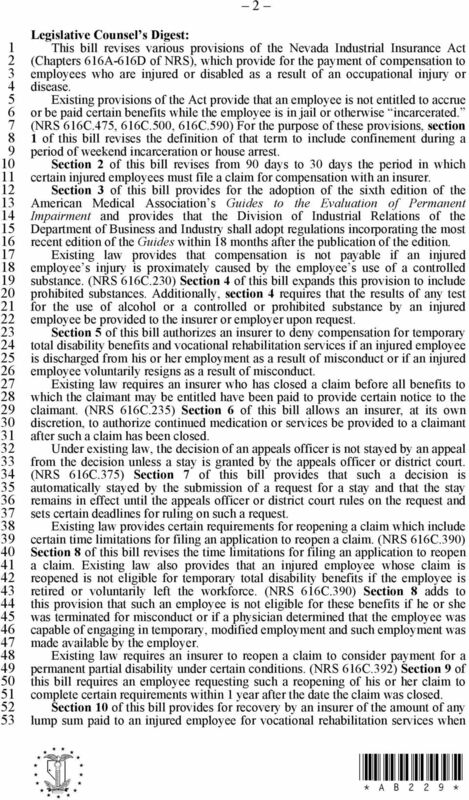 COMMITTEE ON COMMERCE AND LABOR MARCH, 0 Referred to Committee on Commerce and Labor SUMMARY Revises provisions governing workers compensation. (BDR -) FISCAL NOTE: Effect on Local Government: No. Effect on the State: Yes. ~ EXPLANATION Matter in bolded italics is new; matter between brackets [omitted material] is material to be omitted. AN ACT relating to workers compensation; revising the period during which certain injured employees must file a claim for compensation with an insurer; revising provisions relating to the adoption by reference of standards for evaluating permanent impairment; providing that compensation is not payable if an injury is proximately caused by an employee s use of a prohibited substance; providing that the results of any test to determine whether an injured employee used alcohol or a controlled or prohibited substance must be made available to an insurer or employer upon request; authorizing an insurer to deny compensation for temporary total disability and vocational rehabilitation services under certain circumstances; revising procedures relating to the stay of a decision of an appeals officer; revising provisions relating to the time period and requirements for reopening a closed claim; revising provisions relating to the payment of benefits for a temporary total disability or vocation rehabilitation services following the reopening of a claim; revising provisions relating to certain payments to an injured employee of lump-sum compensation; and providing other matters properly relating thereto. 3 0 an injured employee is determined, subsequent to the payment of the lump sum, to be permanently and totally disabled. Section of this bill revises provisions concerning the gross wages and employment benefits which must be provided pursuant to an offer of temporary, light-duty employment. 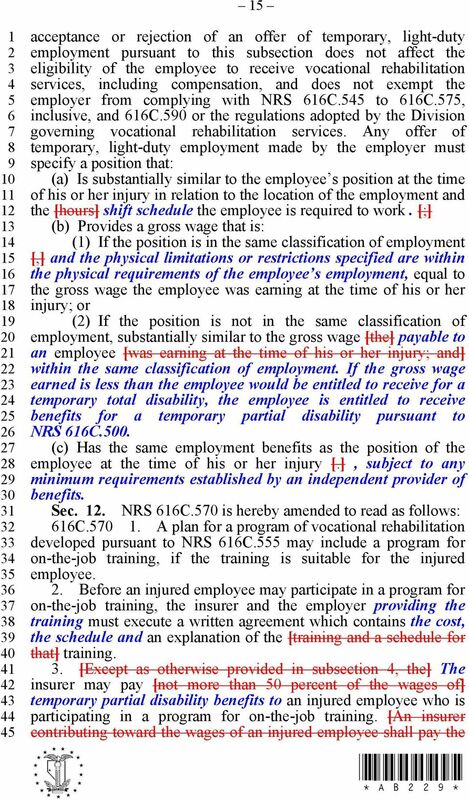 Existing law provides for the development of a plan for a program of vocational rehabilitation for certain injured employees, which may include on-the-job training. Under existing law, the insurer is required to pay a percentage of the wages of an employee who is receiving such training. 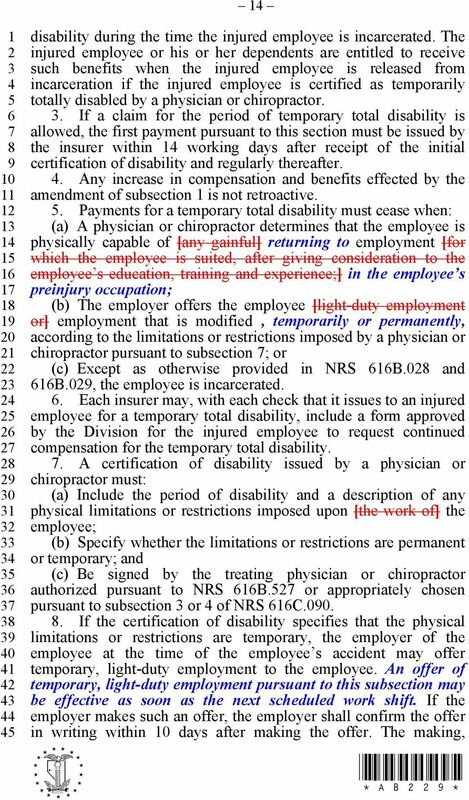 (NRS C., C.0) Section of this bill provides, instead, for the payment of benefits for temporary partial disability to such an employee. 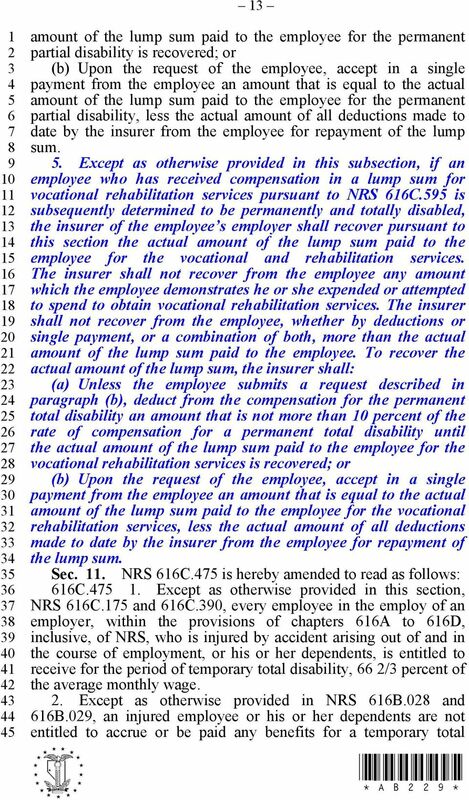 Section of this bill revises provisions relating to an injured employee s entitlement, after the lump-sum payment of a claim, to vocational rehabilitation services or benefits for a temporary total disability. THE PEOPLE OF THE STATE OF NEVADA, REPRESENTED IN SENATE AND ASSEMBLY, DO ENACT AS FOLLOWS: 0 0 Section. NRS A.0 is hereby amended to read as follows: A.0 [ Incarcerated ]. Except as otherwise provided in subsection, incarcerated means confined in: [.] (a) Any local detention facility, county jail, state prison, reformatory or other correctional facility as a result of a conviction or a plea of guilty, guilty but mentally ill or nolo contendere in a criminal proceeding; or [.] (b) Any institution or facility for persons with mental illness as a result of a plea of not guilty by reason of insanity in a criminal proceeding, in this State, another state or a foreign country.. For the purposes of NRS C., C.00 and C.0, a person is also incarcerated while confined during a period of weekend incarceration or house arrest. Sec.. NRS C.00 is hereby amended to read as follows: C.00. 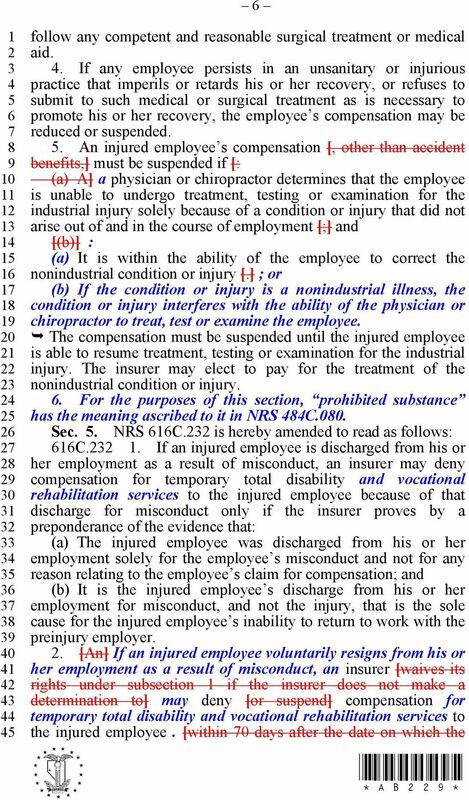 Except as otherwise provided in subsection, an injured employee, or a person acting on behalf of the employee, shall file a claim for compensation with the insurer within  0 days after an accident if: (a) The employee has sought medical treatment for an injury arising out of and in the course of his or her employment; or (b) The employee was off work as a result of an injury arising out of and in the course of his or her employment.. In the event of the death of the injured employee resulting from the injury, a dependent of the employee, or a person acting on behalf of the employee, shall file a claim for compensation with the insurer within year after the death of the injured employee. 4 The claim for compensation must be filed on a form prescribed by the Administrator. Sec.. NRS C.0 is hereby amended to read as follows: C.0. For the purposes of NRS B., B., B., C.0 and. 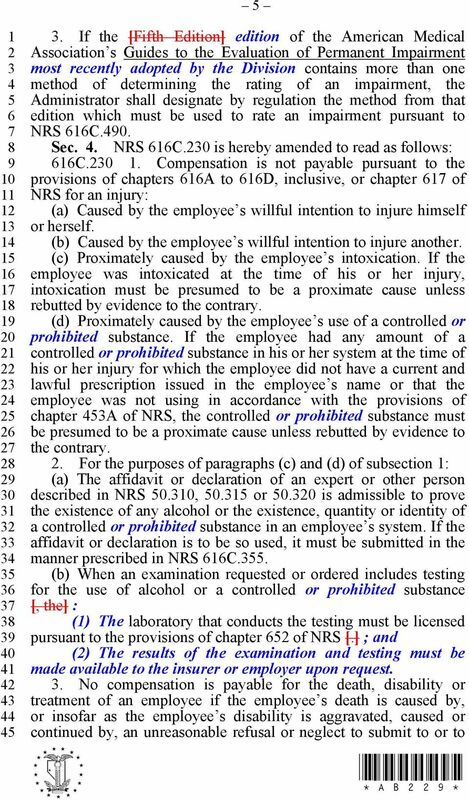 [, not] : (a) Not later than August, [00,] 0, the Division shall adopt regulations incorporating the American Medical Association s Guides to the Evaluation of Permanent Impairment, [Fifth] Sixth Edition, by reference. 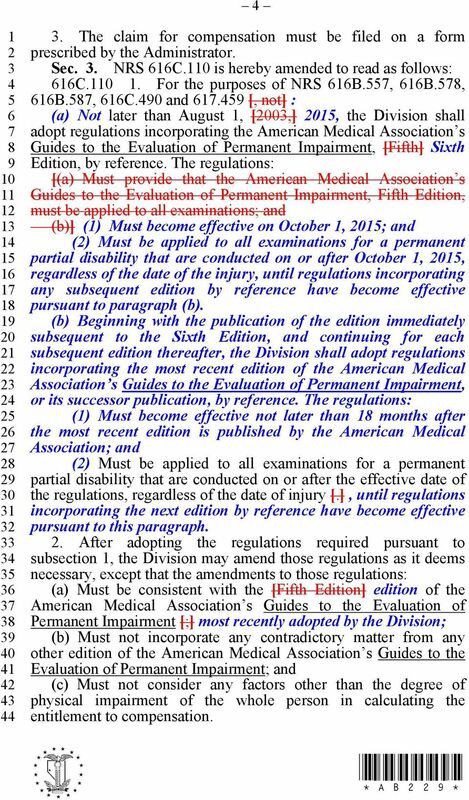 The regulations: [(a) Must provide that the American Medical Association s Guides to the Evaluation of Permanent Impairment, Fifth Edition, must be applied to all examinations; and (b)] () Must become effective on October, 0; and () Must be applied to all examinations for a permanent partial disability that are conducted on or after October, 0, regardless of the date of the injury, until regulations incorporating any subsequent edition by reference have become effective pursuant to paragraph (b). (b) Beginning with the publication of the edition immediately subsequent to the Sixth Edition, and continuing for each subsequent edition thereafter, the Division shall adopt regulations incorporating the most recent edition of the American Medical Association s Guides to the Evaluation of Permanent Impairment, or its successor publication, by reference. 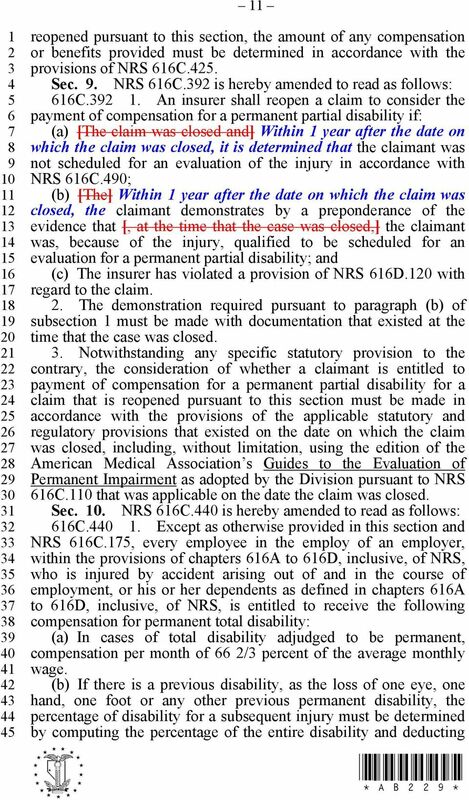 The regulations: () Must become effective not later than months after the most recent edition is published by the American Medical Association; and () Must be applied to all examinations for a permanent partial disability that are conducted on or after the effective date of the regulations, regardless of the date of injury [. ], until regulations incorporating the next edition by reference have become effective pursuant to this paragraph.. After adopting the regulations required pursuant to subsection, the Division may amend those regulations as it deems necessary, except that the amendments to those regulations: (a) Must be consistent with the [Fifth Edition] edition of the American Medical Association s Guides to the Evaluation of Permanent Impairment [;] most recently adopted by the Division; (b) Must not incorporate any contradictory matter from any other edition of the American Medical Association s Guides to the Evaluation of Permanent Impairment; and (c) Must not consider any factors other than the degree of physical impairment of the whole person in calculating the entitlement to compensation. 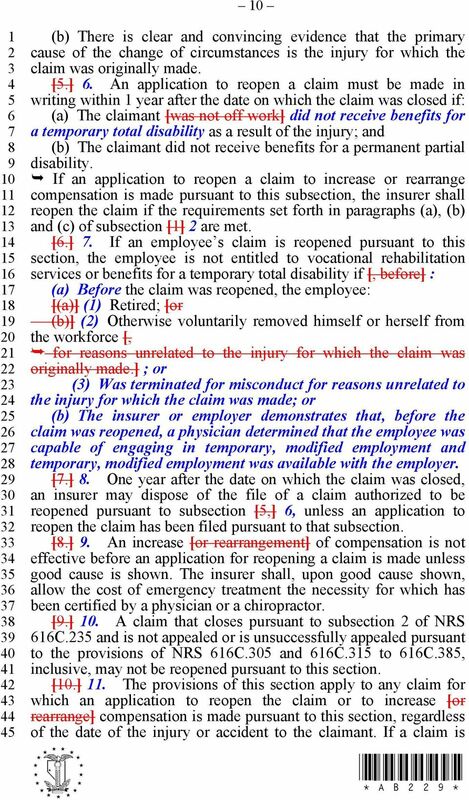 8 (b) The injured employee may appeal the closure of the claim pursuant to the provisions of NRS C.0 and C. to C., inclusive; and (c) If the injured employee does not appeal the closure of the claim or appeals the closure of the claim but is not successful, the claim cannot be reopened.. 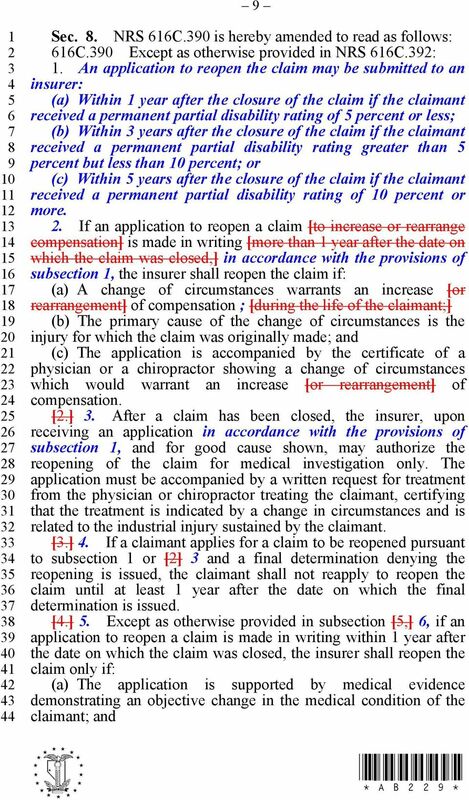 In addition to the notice described in subsection, an insurer shall send to each claimant who receives less than $00 in medical benefits within months after the claim is opened a written notice that explains the circumstances under which a claim may be closed pursuant to subsection. The written notice provided pursuant to this subsection does not create any right to appeal the contents of that notice. 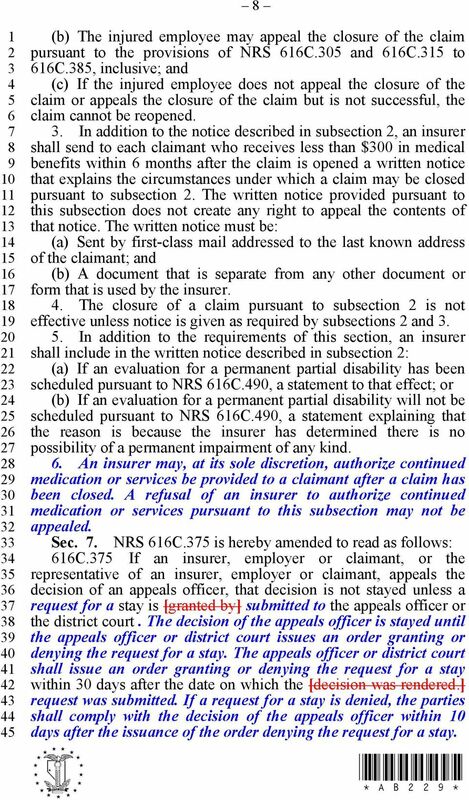 The written notice must be: (a) Sent by first-class mail addressed to the last known address of the claimant; and (b) A document that is separate from any other document or form that is used by the insurer.. The closure of a claim pursuant to subsection is not effective unless notice is given as required by subsections and.. 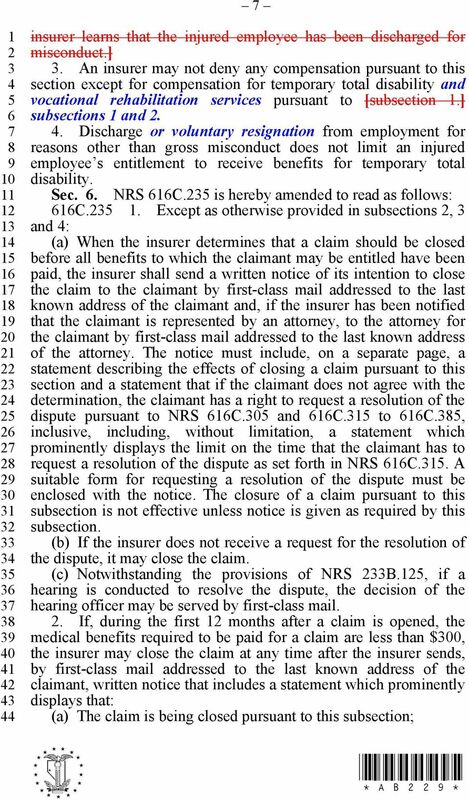 In addition to the requirements of this section, an insurer shall include in the written notice described in subsection : (a) If an evaluation for a permanent partial disability has been scheduled pursuant to NRS C.0, a statement to that effect; or (b) If an evaluation for a permanent partial disability will not be scheduled pursuant to NRS C.0, a statement explaining that the reason is because the insurer has determined there is no possibility of a permanent impairment of any kind.. An insurer may, at its sole discretion, authorize continued medication or services be provided to a claimant after a claim has been closed. A refusal of an insurer to authorize continued medication or services pursuant to this subsection may not be appealed. Sec.. NRS C. is hereby amended to read as follows: C. If an insurer, employer or claimant, or the representative of an insurer, employer or claimant, appeals the decision of an appeals officer, that decision is not stayed unless a request for a stay is [granted by] submitted to the appeals officer or the district court. The decision of the appeals officer is stayed until the appeals officer or district court issues an order granting or denying the request for a stay. The appeals officer or district court shall issue an order granting or denying the request for a stay within 0 days after the date on which the [decision was rendered.] request was submitted. If a request for a stay is denied, the parties shall comply with the decision of the appeals officer within 0 days after the issuance of the order denying the request for a stay. 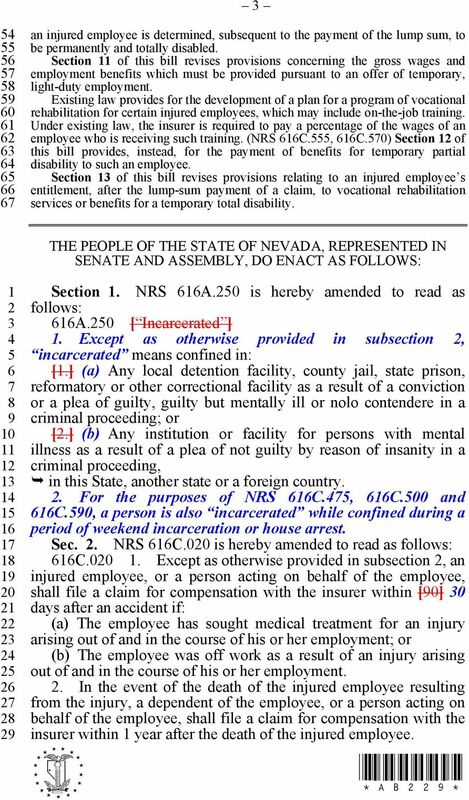 17 () That the injured employee is urged to seek assistance and advice from the Nevada Attorney for Injured Workers or to consult with a private attorney before signing the agreement. 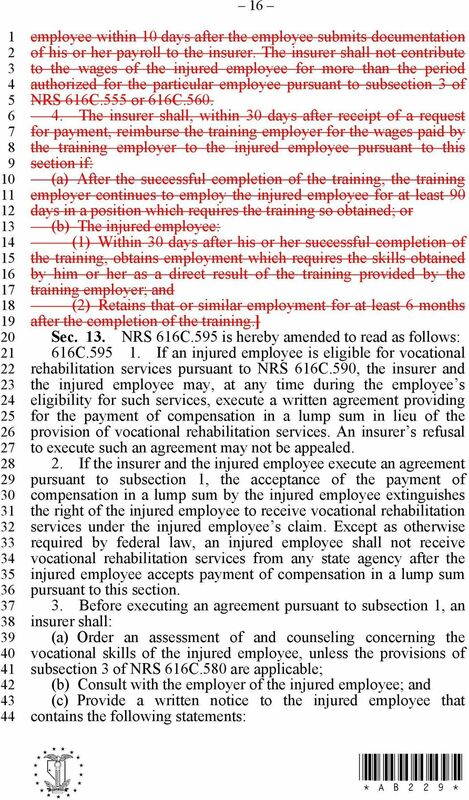 () That the injured employee may rescind the agreement within 0 days after the injured employee signs it. 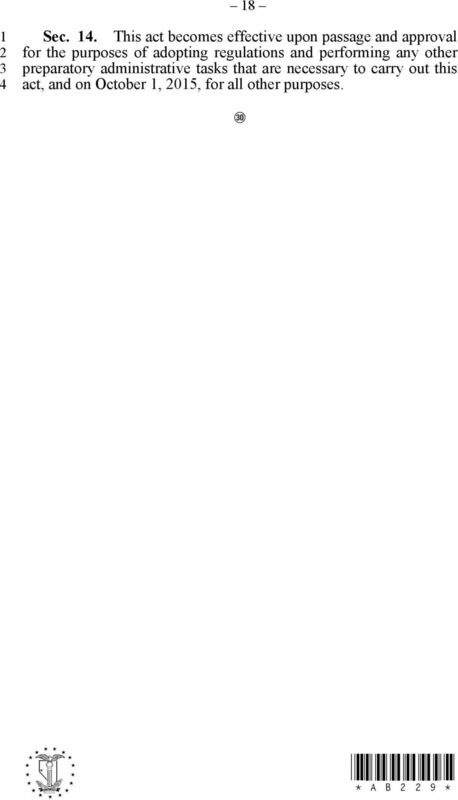 () That the 0-day period pursuant to subparagraph () may not be waived. () That acceptance by the injured employee of payment of compensation in a lump sum in lieu of the provision of vocational rehabilitation services extinguishes the right of the injured employee to receive such services.. 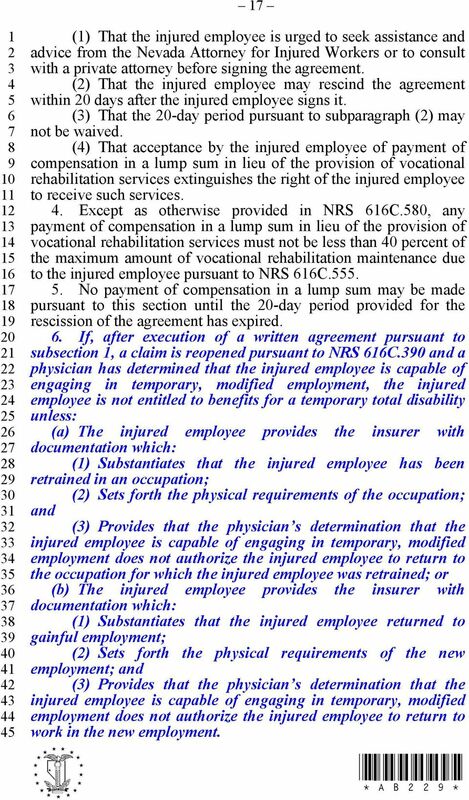 Except as otherwise provided in NRS C.0, any payment of compensation in a lump sum in lieu of the provision of vocational rehabilitation services must not be less than 0 percent of the maximum amount of vocational rehabilitation maintenance due to the injured employee pursuant to NRS C... No payment of compensation in a lump sum may be made pursuant to this section until the 0-day period provided for the rescission of the agreement has expired.. 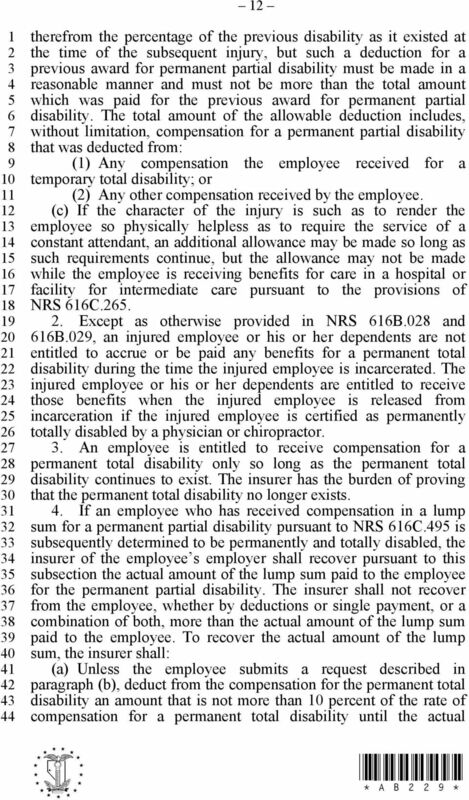 If, after execution of a written agreement pursuant to subsection, a claim is reopened pursuant to NRS C.0 and a physician has determined that the injured employee is capable of engaging in temporary, modified employment, the injured employee is not entitled to benefits for a temporary total disability unless: (a) The injured employee provides the insurer with documentation which: () Substantiates that the injured employee has been retrained in an occupation; () Sets forth the physical requirements of the occupation; and () Provides that the physician s determination that the injured employee is capable of engaging in temporary, modified employment does not authorize the injured employee to return to the occupation for which the injured employee was retrained; or (b) The injured employee provides the insurer with documentation which: () Substantiates that the injured employee returned to gainful employment; () Sets forth the physical requirements of the new employment; and () Provides that the physician s determination that the injured employee is capable of engaging in temporary, modified employment does not authorize the injured employee to return to work in the new employment. ADOPTED REGULATION OF THE BOARD OF OCCUPATIONAL THERAPY LCB File No. R017-14 Effective October 24, 2014 EXPLANATION Matter in italics is new; matter in brackets [omitted material] is material to be omitted. What is the unemployment insurance program?